Fields of Blood: What if.....Round Bases are a Troll? Of all the things that have got people upset in the current Sitzkrieg, the possibility of round bases is the most controversial. This is because it changes the nature of the game - away from massed ranked battle - in all likelihood and the logistical requirement to re-base existing figures. But what if it is a troll? The two major sources of "confirmation" that the WHFB are going to round bases are the studio pictures of "some" models on round bases e.g. Lizards at Warhammer World Open Day, some Skaven war machines etc. 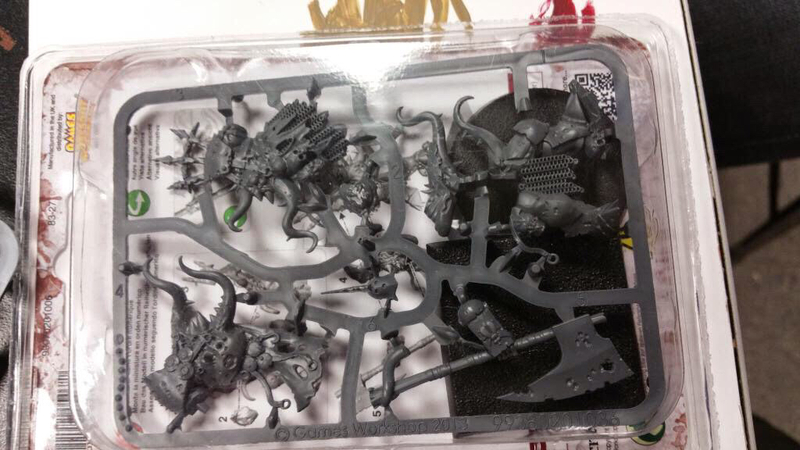 And two pictures floating the net of Gutrot Spume and the new Grey Seer where round bases are in the clam pack. Currently there has been no confirmation that anyone who has actually purchased a model - aside from these two instances - has received a round base in their pack. If you go to your local GW and look at new stock you don't see round bases included. Also the big removal Saturday did not see the removal of square bases from the shelves. Now I have no knowledge one way or another....but what if this is all a big troll by the studio? They would have certainly caught some fish! If this turns out to be the case I'll be the first to admit I was sucked in. It's actually about the best news I can hope for! I'll do a little happy dance if this is the case. If it is a troll by the studio, what would they actually hope to achieve as a consequence? They wanted to catch our attention... and they f...ng did it.